Audio recordings of the Mazama Pocket Gopher. Audio files copyright Jeff Rice and Gail Olson (WDFW); Use of these audio files is allowed in accordance with the Creative Commons Attribution-Noncommercial-No Derivative Works 3.0 United States License; http://creativecommons.org/licenses/by-nc-nd/3.0/us. Additional assistance with this recording was provided by Chris Capelli, Sarah Coven and Kelly Perry. 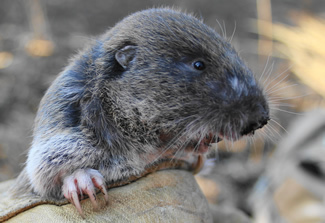 Species status: Mazama pocket gophers are listed as a threatened species in the state of Washington and are a candidate for listing under the federal Endangered Species Act. Acknowledgements: Recording was made with assistance from the Washington Department of Fish and Wildlife; support for Mazama Pocket Gopher study was provided by a recovery fund grant from the U.S. Department of Defense. Additional assistance with this recording was provided by Chris Capelli, Sarah Coven and Kelly Perry. Read more about the Mazama Pocket Gopher. Download a Mazama Pocket Gopher ringtone. Jeff Rice is the managing editor of the Encyclopedia of Puget Sound. Gail Olson is a biologist at the Washington Department of Fish and Wildlife.